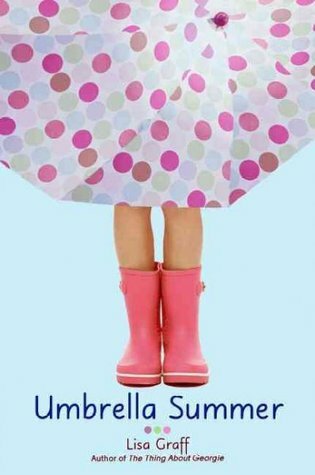 Author of Umbrella Summer, Lisa Graff, is here to share some thoughts about her new book for younger readers: Sophie Simon Solves them All. Foodie Bibliophile: Other than this being your first book for younger readers, how does Sophie Simon differ from your other books? Lisa Graff: All of my other books so far have been pretty realistic school stories, but Sophie Simon Solves Them All is more what my editor likes to call “one foot in reality.” It’s more exaggerated, definitely more goofy, but still relatable. I like to think that if Beverly Cleary and Roald Dahl had a love child, it would be Sophie Simon. FB: To counter the last question, what about this book makes it a "Lisa Graff" book? LG: I have a pretty offbeat sense of humor, and I think that’s been present in all my books, even if it’s much more on display here. And another thing I’ve tried to do in all my books thus far is bring in multiple plotlines, which somehow crash into one another at the end. That element is probably the reason I end up having to write so many drafts of each book, to make sure the plotlines crash in just the right way, but it’s probably also my very favorite part of the process. FB: Which of your books is your favorite? Or is that like asking you to choose your favorite child? LG: It is a bit like asking to pick a favorite child! :) But as I don’t have any children, I don’t mind being a terrible mother and answering . . . I love all of my books, of course, and I think that, like children, they all have different “personalities.” And usually the one I’m working on at the moment is the one I cite as my favorite. But of all of them, I think Umbrella Summer will always hold a special place in my heart, because it’s the most closely based on my life. FB: As an English teacher, I dole out tons of advice and lessons about writing, but it's always nice to hear it from someone who's an actual published writer, so what would be your number one piece of advice to give to middle school students about writing? FB: Is writing your day job? If not, what else do you do besides write? LG: Writing is my day job now, although until earlier this year I worked as a children’s book editor at a publishing house, which is a job I absolutely loved. After a long time working as both a writer and an editor, I decided to concentrate solely on the writing side of things. It’s been a lot of fun so far, but it is definitely a transition making sure to sit myself down in my chair, when no one is there to make sure I’m getting my work done! FB: What's the weirdest/worst job you've ever had? LG: When I was in college I spent a year working at an eye research lab, where one of my many tasks was to slice up frozen rat eyeballs (yes, really). I also worked for two summers as a Girl Scout camp counselor, which is probably the only place one gets paid to cook a turkey in a fire pit and engage in three-legged scavenger hunts (not at the same time). FB: In Sophie Simon, Mr. St. Cupid is the ridiculously, comically unfair teacher in the story. Was he inspired by a particular teacher of yours, or was he there just to show an exaggerated sense about how kids feel about rules? FB: Since Sophie is such a genius, where do you see her choosing to attend college (early of course)? What would be her major? LG: Ooh, this is such a good question! Hmmm . . . For some reason I see Sophie ending up at Caltech (the California Institute of Technology) in Pasadena—partly because I can clearly envision her working at NASA’s Jet Propulsion Laboratory, and also because I once heard that the students there are so serious that the faculty allow them to keep cats in the dorm rooms, just to cheer them up a little bit. (This could very well be a myth, but in any case I like the idea of it. And for the record, Sophie would definitely say no to the cat. It would deter her from her studies.) I’m thinking she’d make up her own major, something that combined all her favorite subjects. Psycholochemicalcuhistory, perhaps? FB: Will we be seeing more of Sophie? She feels like a character that has more conundrums to solve. Perhaps even a mystery? LG: I’d love to write more about Sophie! I actually have snippets of outlines for several books, but have been so wrapped up working on other things lately that I have yet to have a go at any of them. But hopefully soon . . .
LG: Oh goodness, I think those problems might be too big even for Sophie! Probably instead of trying to fix things (very likely impossible), she would instead prepare for the inevitable, and focus on what to do after the collapse of civilization. She would most likely take a page out of Rome’s history book and use that as a model. Just because Ancient Rome went kaplooey, you don’t see the Italians moaning about it, do you? No, sir! So, for example, Sophie would begin to set up cheesy men in togas outside of what are now our football stadiums, just as they do outside the old Coliseum, to capitalize on tourism. And she’d definitely invest in a quality gelato maker. Those sorts of things. Personally, I’m looking forward to it. FB: What would Sophie say to President Obama if she had an audience with him? LG: Sophie is a big fan of looking to history and the wise men and women who have come before us for help with the future, so I think she’d offer President Obama some advice from another great leader, Mr. Winston Churchill: “You have enemies? Good. That means you’ve stood up for something, sometime in your life.” (Of course, it was also Churchill who said, “You can always count on Americans to do the right thing—after they've tried everything else.”) But probably she’d just ask him if he’d read any good books lately. FB: That first Wiston Churchill quote is one of my favorites! It's a great reminder to all people that you can't do a job with heart and passion without someone out there disapproving. Thank you so much Lisa for stopping by today! Sophie Simon Solves Them All is in bookstores now. Farrar, Straus & Giroux is giving away a free copy of Sophie Simon Solves Them All to one lucky blog reader! Just send an email to graff.lisa@yahoo.com, along with the name of this blog, for a chance to win (winners will be notified within the week). Fun interview! I read Umbrella Summer a while ago and really enjoyed it, so I'm looking forward to reading Sophie Simon Solves Them All.